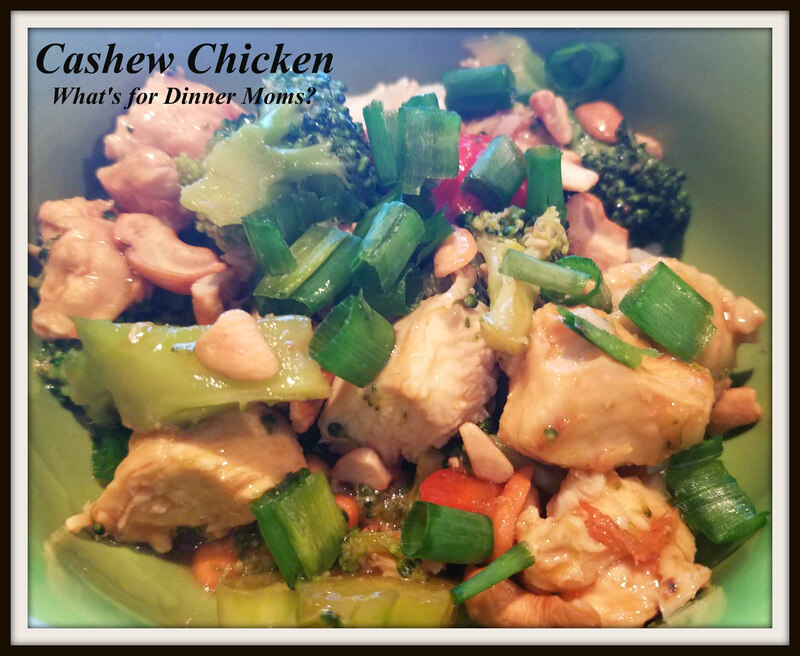 Cashew Chicken II – What's for Dinner Moms? I love simple and quick meals. Quick to me is anything under 30 minutes. This recipe clocked in at about 35 ish so for me that was good. If I had left out the broccoli it would have been about 25 minutes. What saves time is having meat and vegetables prepped early. When I freeze some of my chicken I cut it into chunks, strips, or pounded down so that I can thaw exactly what I need. The extra 15 minutes or so it takes to prep the chicken ahead of time is worth it. We also like to prepare vegetables on Sundays. We cut a few packages of peppers, broccoli, carrots, and celery to have on hand for stir fry, put in a steamer basked, or to throw in a casserole. If the vegetables and meat are prepped you can jump right in to making dinner. Saves a bit of time on those busy dinner nights. Everyone loved this dish! Even my nut hating son tried it and liked it. I think the best compliment was the nuts didn’t taste bad. We added broccoli, peppers, and carrots to this dish to up the number of vegetables the kids were eating. We like things with a lot of sauce too so this has extra sauce in it. If you like your dishes with not so much sauce cut this in half. This looks like an intimidating list of ingredients but it really is very simple to make. A delicious stir fry with a bit of crunch. In a mixing bowl, toss chicken with 1 tablespoon cornstarch. In a large skillet, heat 1/2 tablespoon vegetable oil over medium-high heat. Once oil is hot, add half of the chicken, and cook stirring frequently, until chicken is is golden brown and has cooked through. Transfer chicken to a plate and add another 1/2 tablespoon vegetable oil to skillet. Cook the rest of the chicken until golden brown and cooked through, then transfer to plate with first batch of chicken. Don’t over crowd pan because it will steam and not fry while cooking. In a mixing bowl stir chicken stock, hoisin sauce, soy sauce, rice vinegar, honey, sesame oil and remaining 2 teaspoons cornstarch until well blended. Heat remaining 1 1/2 tablespoons vegetable oil in skillet over medium heat. Add green onions, garlic, broccoli and red pepper to pan. Stir until veggies are tender-crisp, about 3-5 minutes. Transfer to a large plate. Pour sauce mixture into pan and stir constantly, until sauce boils and thickens slightly.Remove from heat, add chicken, veggies and cashews to sauce and toss to evenly coat. Serve warm with rice or noodles. May I suggest using potato flour instead of cornstarch, and seasoning it with some Chinese five spice and/or powdered garlic and Szechuan peppercorns? You can make it however you like! I love Asian style dishes. They are mostly with a lot of vegetables and I love the taste of soy sauce, too. I do too. I am starting to become a bit sensitive to sesame oil lately though. The smell makes me nauseated. I love it too though. Oh, that’s not good but thank God you can still switch to alternative oils. One of my favorite dishes. Full day of so much flavor!